The game will air on CBS Sports Network with puck drop set for 7:30 p.m.
Sean Maguire will be in goal for BU for both games and throughout the post-season. Matt O’Connor’s collapsed lung required surgery (see reports below), and his season is over. Both team are led in scoring by a freshman. 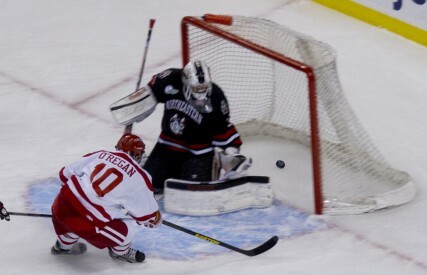 Danny O’Regan (photo, credit Michelle Jay, DFP), with a 12-18-30 line, is one point ahead of his linemates, Matt Nieto and Evan Rodrigues, and Cason Hohmann. The Huskies’ Kevin Roy (17-17-34) is Hockey East’s top-scoring rookie; however, he missed last weekend’s games with an upper body injury and is questionable, according to the Daily Free Press preview. Vinny Saponari has 29 points and scored the game-winner in NU’s 6-5 win over BU on Jan. 18 after the Terriers had rallied from a three-goal deficit. CORRECTION: In Thursday's blogpost, the NESN featuring involving senior Sean Escobedo was incorrectly identified as a report on BU Hockey's involvement with Autism Speaks. The focus of the story was Sean's work with one austistic boy through Athletes 4 Autism, a sports inclusion program for kids with autism that was developed by former Terrier Kevin Gilroy and now is a program of the Autism Research Foundation. Adrian Aucoin, the ex-Terrier with the longest current NHL tenure, at 39 is providing leadership to the young Blue Jacket defenseman. He is profiled by the Vancouver Sun. Dave van der Gulik’s 17th goal was the game-winner in Lake Erie’s 2-0 win over Peoria.